Really appreciate your effort in keeping Erics contact with the group going as best as possible. Is there any possibility of Eric willing to give lectures/course feedback? Would he be open to small group lectures where attendees pay for the privilege of getting a small group lecture and feedback? It'd probably generate a decent amount of cash to support and help Eric along and at the same time for those who truly want to learn and understand his work would get the opportunity to sit and learn via lecture w/ Q&A. It doesn't even have to be in person either, technology allows for remote live group interaction. autodidact learning while possible for some still lacks the feedback and free-associated knowledge gained from actual face time with an educator. further too, it would also lend itself to where not only he could 'teach' and educate but also have 'lab' time instruction. that would help in getting a lab back to him as well. organized annual teaching courses are very common in engineering and scientific industries. I'll mention the idea to him again. His response last time I mentioned it wasn't in favor of the idea because of the possibility of forming an ant trail to his hideout. That is a small obstacle to overcome so I'll see if I can convince him of it again. Many thanks for the update on Eric's condition and good to see he is making some headway. Getting a letter off to him with some pictures and hoping he may be able to answer some questions with regard the Vacuum Tube devices. Ready to power up the CSI here with his Vacuum Tube Pulse Generator which works well but he has not progressed with any plan and I guess he did have a plan in mind. Have a situation here where I need to attennuate the signal input to the CSI as it pegs the Intensity meter out of the Extra Coil. So weak is the signal output from the Sig Gen (100mV - 20db attenuation and minimum output) that my regular Frequency readout can no longer read and have had to revert to one I made up in kit form some years ago. Will get back when I have some powered results. Just needs a bigger amp meter at the output and something bigger than the 50uA. This only happens when you have a capacity between secondary and extra and preferably variable. Progressing with Moray and more on that later. Have just built a modified (240v vice 117v) +/- 700volt power supply from 'The Radio Handbook' by William Orr (Page 698) and the next article happened to be on multivibrators. Interesting here to see that William noted that the split-reed was just 'new' and that was in 1959 when the PP-18/AR was first used during WW2. Cant seem to get time to build that device but perhaps after the CSI. Have other information here on multivibrators for anyone needing assistance. The Handbook above is available from Scribd but they are asking $9 for a monthly account which I do from time to time as my list builds for special books. Excellent work and diagrams as usual, however, two questions. Don't see any difference between the Tandem and the Concatenated drawings and would have expected the Concatenated output to be way above the Tandem but that is not the case. Getting back into the CSI testing after all the Vacuum Tube builds and seeing some results that are not making sense. Very clear to have a capacity between Secondary and Extra and using a small variable single-gang radio Condenser vice the Copper ring is worthy of experiment. Have completed the integrated and variable Condensers into the Primary and testing that now. Will put up a pic at 'n6kph'. ... Getting back into the CSI testing after all the Vacuum Tube builds and seeing some results that are not making sense. Dear David G Dawson, I can't be sure what this means: "single-gang radio Condenser vice the Copper ring" or even (if it turns out to be a typo e.g. 'via') come up with a certain guess. Could it be "in series with" or "in parallel with"? Many thanks for sharing so much of your hard work. "As for the Extra Coil I cannot overemphasise NO direct metallic connection. NO. It must be capacitive coupling in test setup. It MUST." In preference to the Copper rings (which I have here to the exact size) as the coupling capacitive medium, I am simply using an old radio single-gang Condenser to give me some idea of what this is all about and this makes the tuning easier as there is no physical adjustment of the rings. I will go back to the rings as a comparison a little later. Posting some pics now at 'n6kph'. Has anyone else spoken with George? I've been emailing him and he just said that there has been progress since the last time I emailed him (2 months ago roughly) and he'd let me know when there was more progress. I offered to buy them from him as I thought it'd be fairly easy to source the funds through this forum but he declined this offer because the SF Tesla society has a reputation to uphold and cannot release bad quality lectures, or something along those lines anyway. Chazza, you want a capacitance so to tickle the extra coil circuit but not force it into oscillation as you would with a direct metallic connection so that the extra coil is free to resonate by itself on it's own terms and not dictated by the secondary, only excited. At least that's how I am seeing it. Thanks Smokey. No you're not missing anything. The setup is exactly the same in both situations, only the frequency is different. Also as Eric said no one knows if Concatenated resonance is even possible, everything so far has resulted in a lower Concatenated mode potential than Tandem mode. Although I'm measuring it through the field that can be picked up around the coils, so I'm not ruling out the possibility that only the "measured" potential is lower at the given distance, the field itself is different so it's not necessarily an accurate comparison I don't think. I had previously put the lower Concatenated potential down to the fact the secondary is too high frequency and needs to be tuned down a lot resulting in an an inefficiency, but since replacing the test coil with the two turn primary and adding a condenser I'm not so sure about that any more either. So there's still plenty of room for more tests on everything. I read your post about Eric's device in his car and the reference you posted to it. But, after reading the reference, I don't understand what device you are talking about. Sorry for being dense, but what there is related to the Tesla Switch? This is a video of the field intensity using an AV plug and 3 parallel red LEDs. I know Eric said not to use LEDs but I'm not using enough power for incandescent bulbs, this is just to show the effect as seen in the test setup. There isn't amazing clarity because it's difficult to show the effect and the overall situation at the same time, but I think enough can be seen to get the idea across. The coils are tuned exactly as before, except now the one turn test coil has been replaced with the two turn primary, there's no primary condenser, and the coupling is tighter than before, hence the higher voltage. Note that the Concatenated mode extra coil probe reading has increased from 65mV to 99mV as a result of the tighter coupling, but the secondary probe has gone from 5mV to only 7mV. With some more adjustment I think the secondary can probably be tuned out (of measurement) completely, but there's no definite confirmation of this yet. There also appears to be some phase differences between the two coils in this mode. It's too early to say more than that because of the difficulty in measuring it, but there's definitely a slight phase difference observed compared to Tandem mode. I would speculate to say that when the secondary is "tuned out" properly then the phase difference should be maximised, but then it would be unmeasurable to be able to confirm it. Either way I wouldn't have expected even the slightest phase difference to be detected no matter how small, so it's noted here. Last edited by dR-Green; 11-17-2012 at 08:41 AM. extra coil and the voltage seems to drop off before the top of the secondary. would need to be a HV node at the ground which is impossible. happen when the secondary has a HV node in the same place. extra coil or the equivalent ie, a HV at the bottom and a HV at the top. Extra coil and nowhere else to avoid problem with very high potentials. the same place and time. Wouldn't it ? How would concatenated mode be possible ? What is the wave structure desired for "concatenated mode" ? Last edited by Farmhand; 11-18-2012 at 04:30 AM. I don't think so, because all potential is relative. Whether you have 0 and 10 or 10 and 20, the potential difference is the same in both situations. Also the perspective of the camera makes it look a bit different to what it actually is. I think in Tandem mode what you say applies in terms of where the nodes are, the 1/4 wave distribution has to be over both coils. But in Concatenated mode, I think the idea is more closely explained with sound in a cylinder in the video on the other thread, when the wave reaches the end of the pipe it reflects back. So I think what's desirable in this case is for the secondary to be seen as one finite length (1/4 wave) of tube that causes a reflection of the wave at the top, whatever potential is at the top of the secondary can be considered the "ground" for the extra coil seeing as it's only relative, and the extra coil needs to act as another tube of finite length excited from the "ground" potential equal to the top of the secondary. The lower Concatenated potential obtained so far compared to Tandem mode could be a result of this 1/4 wave reflecting back in the secondary rather than exciting the extra coil efficiently, so if it reflects then how can you equally get it to resonate a second tube is the problem I suppose. But it's all quite confusing so I'm open to thoughts and opinions. Apart from the perspective, I think the LEDs are lit at the bottom of the extra coil to that extent because that's where the wire joining the secondary is, and the field is relatively strong inside the secondary. With the single turn test coil and lower voltage the energy seems to disappear towards the bottom of the extra coil and looks even more obvious than in the video. Why there would be "zero potential" in the extra coil at all is the strange thing, why does the energy that the secondary radiates in that area anyway vanish in this mode, and the same with the extra coil. The potential should be high enough at other points for it to be detectable, there shouldn't be "nothing". So with this in mind among other things I think it will be possible to tune this out completely, I'll start testing that tomorrow. condition is at about 1450 kc depending on the tuning it varies of course. 180 degrees out of phase exactly. I'll do a spreadsheet soon. I found my answer about Eric's car device with a picture of it elsewhere. "There was also the Rotary Electromagnetic Converter, constructed by Michael Knots and Peter Lindemann with the help of Chris Carson." I wonder how many watts that rotary converter produce ? As far I understood, when a cap is high the other is low, so energy shuttled at each turn (3 times per turn). Since the two caps are 180° out of phase, electrostatic force are in equilibrium so it doesn't load the motor. Then an AC current is "induced" between the two caps, current value and voltage droop at the load will indicate Power. Rectifying and choosing the best impedance will be required to extract the maximum of power from the machine. The energy is conserved during the whole process inside the two caps (I neglect capacitor leakage losses). Good work, thanks for the info. I connected a primary condenser last week but then all hell broke loose so I didn't use it for the video. One step at a time I think, it didn't behave as expected at all and until the tuning of the coils is figured out I can see that only making things even more confusing. I've been looking over some of the data from the different extra coils and apparently the "non-existent secondary effect" and peak concatenated potential appears when both coils are tuned to approximately the same frequency, where the secondary and extra coil tuning cross over in the graphs or thereabouts, close enough to call for further inspection, regardless of the length of wire in the different extra coils. I've also managed to increase the extra coil potential and decrease the secondary potential as far as the field intensity is concerned, so I'd say this is controllable through very fine tuning. There are still even more weird things that need to be investigated though. Apparently two separate earthed components (plates/rings) making up the secondary tuning condenser is better than one. Adding more capacitance through a separate earthed plate takes the potential higher than adding capacitance through the earthed ring. By that I don't mean dividing the capacitance equally between the components, I mean adding capacitance in addition to the maximum potential already obtained through the rings. And on a side note, shorting the earthed ring into a continuous loop greatly reduces the effective capacitance. Last edited by dR-Green; 11-19-2012 at 09:53 AM. Jerry E Bayles at electrogravity.com has come up with some most interesting theories which he appears to prove with Maths with reference to the A vector and also with regard to the Pyramids of Giza. An accident when dismantling a 3 piece thin tube antenna which gave a high pitched hiss (high voltage - snake - Caduceus) when it came near the metal roof suggests an Aetheric phenomena which may be linked to Hydrogen. I am into Tubes so will put this one on the project list as it does not appear to be that difficult to replicate but may give us a deeper understanding of the CSI and related phenomena. 'e' which is the natural number of 2.7182818285 (first pdf page12). This was labelled as Jerry's 'Eureka Moment'. Was going to paste the extract into here but it won't happen. On the same page Jerry goes on to talk about 'negative energy' with respect to UFOs. This is similar to what I am currently doing with the Joe Cell by block charging into the negative and looks like Hydrogen is the associated gas we are dealing with here. Have already proven that this increases the holding charge in the Cell from 2 to 2.5 volts. The deeper into the negative the higher the holding charge is what we are attempting to prove here. Have also just finished the 600volt +/- minus power supply and this will be used in a like manner in other areas - going negative as against positive. What this means is that your positive becomes ground and the negative becomes a minus value like -20 volts with what I am using with the Joe Cell. Or you can go deeper into the negative with positive at -20 and the negative at -40 volts - a block negative polarity shift. Have been using a small single gang Condenser between secondary and extra and am able to tune for a signal peak in the headphones and this in a testing option to the Copper rings. Signal also appears to be louder than with the direct connection. Have some large bodied (5.5mm) CV2290 (GEX66) Germanium Diodes coming and will compare with the 1N34A, 1N67A and 1N270 I am currently using in pickup heads. Have a letter going off to Eric and hoping he has the time to respond. Four parameters are given in this graphical presentation, all centered in time about the major “Haiti Earthquake.” Each was derived from daily readings at 1600 hrs U.T.C. Which were entered into the N6KPH station log. Said log and graphical records were lost when the installation was ransacked by Olen Bales. The first parameter (top) is the daily integrated impulse counter. The integration period was 24 hours and the value on the graph is the square root of the daily impulse count. The impulses are derived from a high pass network connecting to the system geo-phone (seismic pickup) that also drives the seismo-scope and seismic recorder. Seismic waves of less than 500 millisecond duration are passed to the counter, this giving a count of local (50 kilometer) seismic vibrations. Hence this particular graphic presentation is a logarithmic measure of local daily seismic activity. The second and third graphical presentation are super-imposed and represent electrical activity. See “System for the Transmission and Reception of Telluric Electric Waves”, by E.P. Dollard. This electric activity was derived from an Earth Signal Antennae Structure. A 1600 foot Beverage (R.C.A.) antenna derived the electrical activity from the displacements in the Earth-ionosphere electrostatic condenser, this denoted the “overground”. In conjugate form an 800 foot Alexanderson (G.E.) of a unique design (confidential) derived the mono-polar electrical activity from the Telluric Displacements within the Earth's Interior, this denoted the “underground”. Signals derived from each antenna structure were fed to an input networks driving an open wire transmission line to the Carrier Equipment Room. Each line terminated at a “Home Brew” western electric “L-1” carrier telephone terminal. 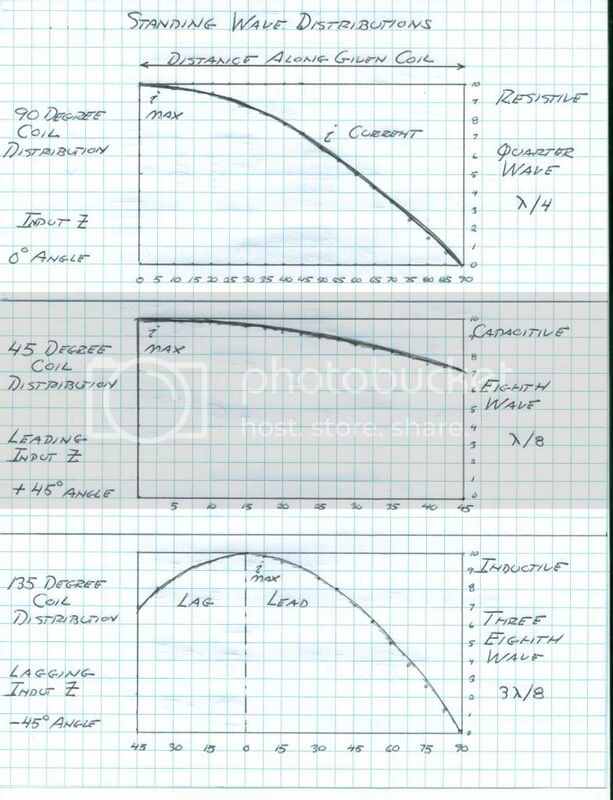 Band separation filters divided the L-1 spectrum into low, medium, & high frequency bands which were applied to their respective repeaters. The signals represented in the graphical representation were derived from the low frequency portion of the L-1 bandwidth. Hereby a V.L.F. spectrum was derived, 0.3 to 20 Kc/sec. Signals were amplified to +10dBm on both overground and underground channels and applied to dividing networks, one output to a Stereo Sound System for audition, the other to special networks. The overground network was in part a high pass filter driving an amplitude modulation detector. This detector then fed to a special differentiating network, then to be displayed on the “Overground Chart” recorder. In a complimentary manner the underground signals passed thru a low pass filter driving a second Amplitude Modulation Detector. This detector then fed to a special integrating network, then to be displayed on the “Underground Chart” recorder. In basic terms the overground chart displayed the level of in-coherent electrical activity outside the Earth, and the underground chart displayed the level of coherent electrical activity inside the Earth. The range of overground indication was world wide on the chart (this chart went high two days before the Great Japan Quake), however the range of the underground indication on the chart was restricted to approximately 250 kilometers so as to single out only local Telluric Signals. 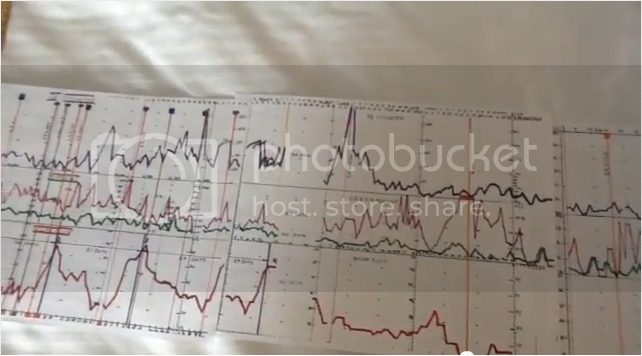 Each daily log entry on the Graphical Presentation was the peak value displayed on the Esterline Angus Chart Recorders for the 24 hour log interval. The Red Graph is the overground peak, and the Green Graph is the underground peak. The underground chart has been known to go “off scale” one to two days before a Southern California earthquake of 6.5 or greater Richter magnitude. During this precursor period the Coherency of the Telluric signals coheres into a pure simple harmonic function between 300 to 1500 cycles per second. This sounds the alarm. The bottom graph shown on the Graphical Presentation is the magnitude of Solar Radiation, or “Solar Flux”. This is measured daily at noon at a frequency of 2800 megacycles per second. One unit of Solar Flux is watts per square centimeter. It is clearly seen that peaks in solar activity directly relate to significant seismic events. Many other systems for Earth Related Electro-Physical study existed at the Mohave Research installation, Spectral Displays, Oscilloscope Displays, and Specialized C.R.T. Displays of exotic configuration, along with high fidelity audition systems. Some of this can be seen on the now defunct “American Marconi Foundation” website. Under threat of a lawsuit by GreenPeace (aka Maritime Radio Historic Society) much material has been removed or prevented from display on this website. In conclusion, the installation at 57474 Linn Road at Landers, California, known as the Mojave Research station N6KPH was compiling data in order to develop an engineerable advance seismic warning system, and in fact was an engineered system for such a purpose. However the non-feasance of San Bernardino authorities, along with the corruption of their “Law Enforcement” and “Legal” system led to the pillaging and destruction of this remarkable station by local criminal elements. Hence no such advance warning system will be developed before the next major California earthquake. This effort is now lost. Only in America can such happen. Last edited by Web000x; 12-03-2012 at 04:24 AM. I have printed these documents and will send them to Eric soon. My letter to Eric went Tuesday with many questions and have asked his permission to present those here with his answers. Main question was to what to expect with powering the CSI with his Vacuum Tube Pulser as he kind of departed without finishing the lesson. Slowly getting Moray together and have found a vintage Germanium Diode in CV2290/GEX66 where the forward voltage is only about 170mV and is physically large at 5.5mm. A 1N34 in comparison Vf = 240mV - a Silicon is double that and more. Other thing that dropped into my lap was a part blown OC16G transistor, much bigger again where the forward voltage was 102mV - the 'G' = Germanium. You can see why they don't want us to use Germanium any more. Have asked Eric about Moray and anything he may have to offer in this area as he was working closely with Farnsworth. More on Moray coming shortly. Don't forget that Moray used radioactive doping; until he ran out. Re the OC16G - connect the collector to the base and recheck. You should get less than 100mV, and oscillation becomes possible at very low supply voltage with a centre tapped inductor (trafo) with ends connected between B and C, '-' to the centre tap and '+' to E. Frequency is limited by junction capacitance and low frequency gain cut off at low voltage. Germanium devices could not go HF with any current (slew rate limited), and also susceptible to thermal runaway. Silicon solved both problems. I had a question about the sun. If I remember correctly, did you say you were concerned about the sun possibly going out? Or that there were some signs you see in the sun that make you concerned about it? I'm sorry if I remember incorrectly what I thought you mentioned about this issue but I was interested in if you had any comments/warnings you'd like to share with us in regards to the state of our sun. You now have your own website The Work of Eric P. Dollard - Beyond Tesla, radio and electrical engineering , getting decent traffic too. Your name gets over 1200 google searches a month. You can now admin the site and make posts etc..
Good to se u go digital. Last edited by techzombie; 11-23-2012 at 08:37 PM. This particular solar cycle (24) is unusually low. Todays solar flux is 128, it should be around 200 or more, since we are at the cycle peak. In the "Dark Ages" the sun went dead on sunspots and this may happen again . Note the Mayans were sun worships (2012). Hi Eric, I hope you are well and it's nice to see you back. I've been doing tests on three different extra coils gathering information on the secondary vs extra coil tuning and so far, in the test setup (single turn test coil) I've been unable to get a higher Concatenated mode potential than Tandem. It does seem that the SHORTER wire length based on the 124% velocity factor that you suggested gives the highest potential, the other two tested had longer wire based on 124% and 119% measured with direct connection. (I also have a new empirical factor of 129% luminal velocity measured on two extra coils). the Colorado Springs Tesla Magnification Transformer is a very simple system, no more than a giant series resonant circuit with an approximately sinusoidal waveform rendered asymmetrical by a moderate dampening constant. The extra coil is not operating as a transmission network of distributed constants, but only as a basic inductance coil. Hence the length of wire on the coil is somewhat immaterial. The mast capacitance swamps out the extra coil self capacitance, this suppressing transmission modes of higher harmonics. What would be "a transmission network of distributed constants"? Or in other words, I'm not an electrical engineer, so is there anything in particular I should be doing or looking for (in the coil calculations from Theory Of Wireless Power for example)? What does "lagging or leading input Z" mean in this diagram, and is this the only way of determining the coupling mode between the coils? Is there any way of controlling the coupling, or is it based on the tuning? As I recently posted, when both the secondary and extra coil are tuned to approximately the same frequency tested alone (extra coil with direct connection), in Concatenated mode the secondary field intensity probe is unable to pick anything up. This happens with all three extra coils tested. This also approximately coincides with the highest potential and highest magnification factor. Does this sound right to you? I've also been wondering how relevant the field intensity actually is in Concatenated mode. If the transformer is working "properly", then shouldn't the field intensity be minimal, since the transmission/output (or input) terminal is the ground end, and this field would represent wasted energy? What about putting a meter between the secondary neutral and ground? Last edited by dR-Green; 11-23-2012 at 11:32 PM. It is given by you that your 'AREA52' activities are classified, restricted, or on a need to know basis. The E.F (forum) I gather, dosen't have the nessasary security clearance for these details; however can you give us any 'clues' about the said AREA52 activities? I don't know what's actually going on, but I finally assembled and tested an "RF Current Probe" from the ARRL Antenna Book, and the extra coil is not working properly I don't think. It shows the same pattern as the LEDs in the video but it's a lot more sensitive and easier to read. About half way up the extra coil the reading drops off completely, then reappears. The highest reading in the whole setup appears to be at the first turn (bottom) of the extra coil. Although, there's a blank spot in the middle of the secondary too in Concatenated mode if I rotate the probing coil 180 degrees. With the rotated probe, Tandem mode appears to have exactly the 1/4 wave current distribution in both coils like Eric's diagram above - highest reading at the bottom of the coils, and nothing at the top of each coil. Rotating the probe back to its original position, it seems to be measuring it in the same manner as the field intensity meter. Last edited by dR-Green; 11-24-2012 at 09:03 AM. From your you tube video you have a HALF WAVE on your secondary and a three eigths wave on your extra coil. The exciting frequency is too high then as indicated by the space distribution with your probe, this a potential device. Neons are better than LED, or make a capacitance pickup for your oscilloscope. With oscillator on X axis and probe on Y axis you can measure phase shift. Read Vol II, Communication Networks, Introduction for distributed constants definition. If your extra coil RAISES the secondary frequency, it is magnetic inductive and wire is too long. If it drops the secondary frequency it is dielectric capacitive and wire is too short on the extra coil. Note, you must have primary condenser on primary loop. Also, place a RF milliammeter in neutral to ground connection for indication of Telluric output. The 6SN7 driver I gave in past can give you more power so as to light lamps. Last edited by t-rex; 11-25-2012 at 12:35 AM. 1) Do not ask about Area 52. 2) I write some on the Wardenclyffe "Science Center" thread that may be interesting. 3) The Wardenclyffe, Tesla True Intention thread is Bearden disinformation shill, or coyote puke.